Looking for tortoise town reviews? We have some of our customer reviews available here! Tortoise Town is a family run company working with over 30 species of 100% captive bred tortoises for sale and turtles for sale. We work hard to give our customers the best customer service of any tortoise breeder or turtle store! We thank our many customers including the thousands we have gotten to know over the years! If you are considering where to buy a tortoise for sale online, read about some of our customers and the tortoise town review they’ve left based on their experience buying a tortoise for sale online, or turtle for sale online from us here at the Tortoise Town family! I ordered a baby leopard tortoise, as well as a baby Sulcata tortoise hatchling for sale online last month from TT. I was emailed tracking that afternoon and they arrived promptly the following morning. Both tortoises are very healthy and active. I searched for quite some time for tortoise breeders and tortoise farms, and I am super happy I chose you guys! Just received my baby Sulcata tortoise hatchling and she(I think) was ready to go as soon as she got out of the box. We did a warm soak and she started to explore and eat away on her plants we planted inside her enclosure! We are super pleased! I could not be happier with my purchase and I would highly recommend TT to anyone wants to buy a baby sulcata tortoise! I ordered a panther chameleon from them (Nosy Faly panther chameleon) and he was shipped great! He was super friendly and is very healthy. They shipped very next day and their customer service was A plus. My guy is really the nicest panther chameleon for sale I have ever seen in fact. More importantly, he is super chill and you can 100% tell they handle their animals! That is worth a lot to me! Thank you so much! I ordered 3 hatchling pink belly side neck turtles, they arrived healthy and warm. I immediately put them in a bowl of water, and they were active right away and also ate hatchlings pellet food. 2 weeks later the turtles are still very active and eating. They are wonderful, color on them is very bright and very good quality. I definitely recommend ordering from these guys. Customer service is awesome as well! I am more than happy with my new pink belly side necked turtle and I will order again from TT soon! Was looking for a Texas Diamondback terrapin These guys had some. Couple messages back and forth and decided to order. Placed order on a Sunday with Presidents’ Day the next day. Received a phone call that they couldn’t be sent out on the holiday and with bad weather coming they watched for a window that would work. They arrived overnight well insulated box and nice and warm. They are very very active and curious little guys. Couldn’t be happier with choosing to buy from Tortoise town. Thanks again and I recommend them for anyone looking to buy a water turtle for sale! My well started baby eastern box turtle arrived today. The care they take with shipping is apparent and he was safe, secure, and warm. When I got my turtle out he was immediately full of energy and active. He ate just a couple of hours later. This baby turtle is alert and healthy. You can take one look at this turtle and know how well taken care of he has been. I will be coming back for all my tortoise and turtle needs! The new turtle is awesome. And thanks for being proponents of captive-bred breeding programs that promote the sale of happy, healthy, CB animals, and ensure that more and more wild turtles and tortoises remain free and where they belong – in the wild. I am more than happy with my purchase and my new turtle is doing wonderful. I would highly recommend them to anyone considering buying a turtle for sale online. Tortoise Town was patient, and very informative answering all the questions I had. VERY satisfied with my baby Sulcata tortoise. He arrived very well packaged and warm. Will definitely recommend TT to any of my friends whom are interested in buying a tortoise or turtle for sale online ! If you are considering sulcata tortoises for sale I highly recommend Tortoise town! Today I got a beautiful leopard tortoise! I was doing research when I can across the tortoise town video for setting up the enclosure. I was so impressed with how much though they put into the video and not just the basic set up but they actually suggested ways for people to save money. At that time I looked up there website and set up my account. I live up in northern Montana and I had a lot of concern about ordering a tortoise for sale online, and how the baby would get here and I wanted to make sure it stayed warm. They were very patiently answered all of my questions and even put up with me asking questions all day while I anxiously waited for the baby to get here. I recommend tortoise town to anyone looking for a new member of their family!!!! I know my family is so overjoyed!!!! Awesome place to buy baby turtles from! I received a baby African side neck and she came fast and warm!! The packaging was great she had a little heat pack to keep her warm and toasty! Definitely will recommend to friends!! And I will definitely be ordering more from them!! I purchased a well started baby hermann’s tortoise for sale last May and he is doing great. I had many questions and tortoise town customer service was excellent. They were very patient with me and made sure I fully understand their answers to my questions about habitat setup. I would recommend them to anyone looking to buy a healthy tortoise for sale online. Bought a sulcata tortoise for sale online from tortoise town a month or so ago. She is doing excellent! Super friendly super healthy awesome baby Sulcata tortoise. Going to get another baby African spur thigh tortoise soon, probably this summer as soon as I have time to build a larger setup! This morning I received the most perfect baby red footed tortoise from tortoise town. I had a lot of questions regarding the setup and they were so helpful and never got annoyed with my novice questions. I would buy a baby tortoise for sale from them again or recommend them in a heartbeat. My son is going to be so surprised when he gets home from school today! 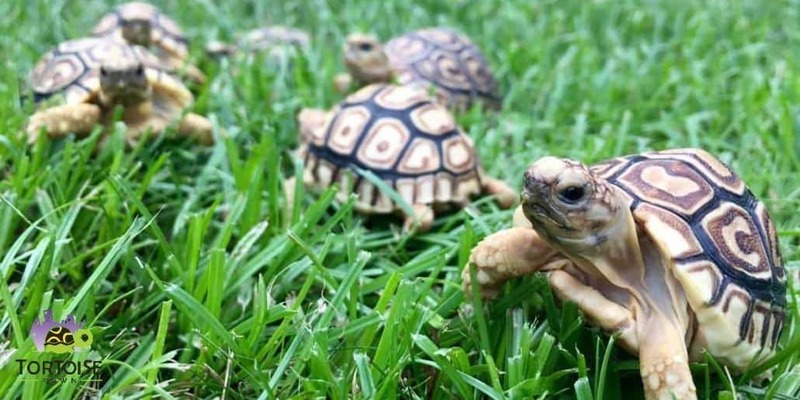 Tortoise town has the best baby tortoises around! Ordered a one year old female yellow foot tortoise for sale in july 2017 its now February 2018, the tortoise came highly recommended and for good reason. Shes quite the character, came in excellent health and has maintained that health couldn’t be happier with her and would highly recommend Tortoise Town as a recommended tortoise breeder to anyone considering buying a baby tortoise for sale. The customer service is the best in the reptile business from my experience these guys are great.